Today, instead of talking about features or prices of coins, I wanted to share an look inside the process of trying to operate a legal cryptocurrency business in today's world. Ever wondered why so many mining pools operate anonymously, or why Mark Karpeles used his personal bank account to store millions of dollars of Mt Gox's customer funds? By the time I'm finished, I believe that you'll be able to understand some of what initially appear to be head-scratching decisions by companies in this industry. It all comes down to one issue: being able to pay taxes. One year ago, it became clear that Prohashing could become a profitable business. Chris and I discussed how we could take advantage of the fact that cryptocurrency prices were rising faster than hashrate. Our initial conclusion was that while profitability was high at the time, the crash two months before due to the ETF rejection had proven that litecoins had to increase tenfold in price (from $4 to $40.) That way, even if there was a crash, we could be profitable mining at $15. The following month, LTC prices did reach $40, so we decided that the best course of action was to invest a lot more effort into the business by increasing our hours and hiring other employees. But since Republicans in the House had just voted to repeal the Affordable Care Act, we were afraid of losing our health coverage to preexisting conditions clauses in the case that we quit our existing jobs and had to stop with this business. We delayed our plans until we could be absolutely sure that we would not receive a letter from the IRS telling us to cease operations. Our search for a lawyer began. The first lawyer we contacted seemed amicable enough, and agreed to a free consultation. He came to our house and we showed him the website, explaining how a mining pool works and clarifying things like how mining pools don't accept deposits. He asked us to write some documents explaining the business to him and he would get back to us. A month later, he had still not replied, so we called him. On the call, he talked about the "comprehensive research" he had done. He had found a case involving a guy with the name of Lord, who was involved in laundering bitcoins for drug dealers. This case informed him that cryptocurrencies were involved with drugs, and that we should be very afraid, and that he didn't know if the business was legal. He then asked for us to write 10 more pages for him for him to learn about the industry and didn't reply for two more weeks. Eventually, after going back and forth with him for 10 weeks, we paid him the $5000 that was completely wasted and fired him. By that time, the projectwas about to fail due to bugs that we could not fix because we still could not devote full time effort to the project. Chris E-Mailed 8 lawyers and not a single one replied. We had to close account registration. On November 1, he was finally able to contact a lawyer who took about a week to write a paper stating that the business was legal. After two weeks' notice, we were able to parallelize the mining server and accept new customers on the day NiceHash lost all its money. The process of finding a lawyer to allow us to go forward required five months, and we estimate that during that time we lost $500,000 due to bugs. Next, Chris had to deal with some litecoins that were marked for the business's use. When he transferred them to the GDAX for sale, Coinbase froze his bank account pending an "internal review" and ignored his support tickets about the issue. But litecoins were increasing in value quickly, so he had to make an emergency decision to sell them anyway. Coinbase effectively stole his money for months while he was unable to contact them; this is why Coinbase has the worst customer service of any company in the world. The solution to get his money out was to buy bitcoins and send them to another exchange. Facing huge penalties, we became desperate for the first time. We then tried to open corporate accounts at multiple exchanges, and this time we received outright rejections. Bitflyer was the only one that had reasonable customer service, and they gave us an account with low trade limits. But we could use the account to trade small amounts each day, they only dealt in bitcoins, which meant we still needed a second exchange account to change other coins to bitcoins, and they could not wire money to the brokerage accounts that we had. 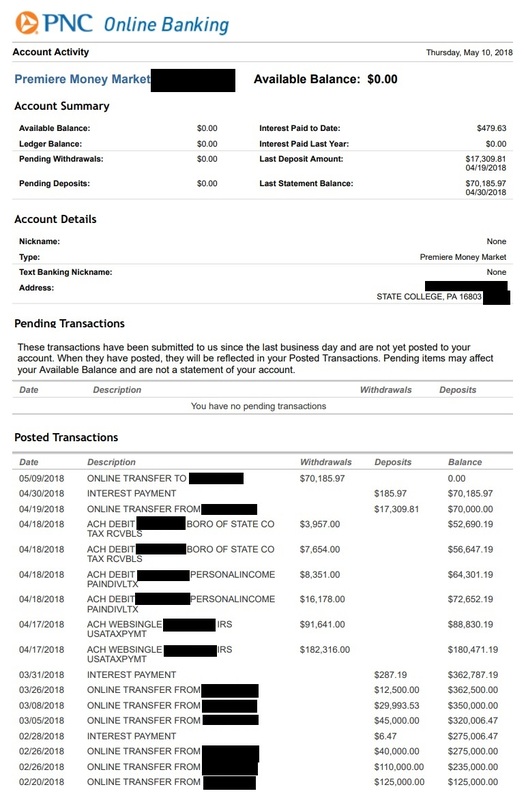 We finally managed to get our money out to the only bank account we could link: Chris's personal PNC Bank account that had been open for five years. Chris used his PNC Bank account to pay the taxes that the business owed. 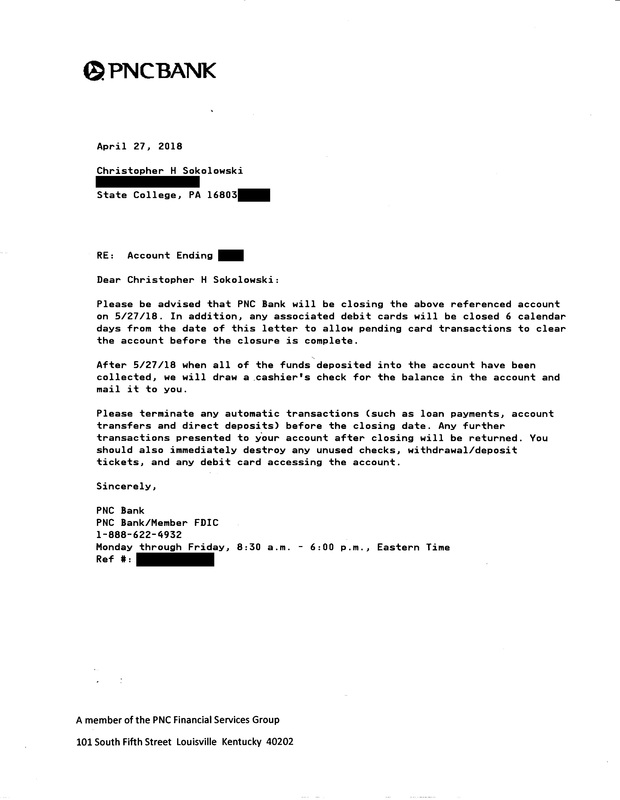 Eventually, PNC noticed the large balance that was present before tax due dates in the account and called him to offer a specialized investment advisor and to sell investments in stocks. They also wanted to sign him up for a number of services that they presumably offer to wealthier clients, which the tax money identified him as. Chris went to the bank and told them that he was mainly using the account to pay taxes but would consider the services they were offering him. But he also mistakenly requested to open a business account with them. The lesson, apparently, is that if you ever want to pay your taxes, don't use PNC. As you can see, we were fortunate to get the next month's money out before it was frozen, as again that would lead to catastrophic penalties from the IRS and the state for missing income and payroll and wage and unemployment and all the other different agencies that need to be paid every month. If you do business with PNC and own cryptocurrencies, there are many banks in the world. I strongly recommend you use one of the others. We then went to several banks and tried to get a new account. We debated whether to inform the banks that we mine cryptocurrencies, and decided that the best choice was to say so during our introduction, driving to every bank in State College until we found one willing to do business with us. Believe it or not, we actually did find one - the Penn State Federal Credit Union (https://www.pennstatefederal.com/). We were able to speak to the CEO, and although there was some initial skepticism, no limits were placed on the account. As I told her, we had a $33m business that couldn't obtain a business account, and fortunately that issue has finally been resolved (after a year of trying!) Anyone can open an account there after paying a $20 membership fee, and I highly recommend them even for personal accounts. In conclusion, the biggest threat to our pool isn't the price of cryptocurrencies, or bugs, or attackers. Instead, we live under the constant threat at the beginning of every month of being unable to pay the company's taxes. We fear waking up to find that another bank or exchange closed our account, has bugs, or went bankrupt. I gave up long ago at trying to take any profit as dollars; we don't even pay rent in dollars anymore. The only thing we want to be able to do in dollars is to sell enough coins to pay taxes. If you ever wondered why so many cryptocurrency companies seem to operate in the shadows, consider that they may not be doing so on purpose; it's just that no lawyers, banks, or exchanges are willing to work with them to allow them to operate legally. I don't understand what it is that these people see is wrong with sending money through the financial system to pay tax agencies. We're more than willing to pay our fair share. If governments don't accept tax payments in cryptocurrencies soon, we are going to be driven out of business. But less scrupulous people won't let that stop them - they simply won't pay. Thanks for sharing this story -- confirms what I've been telling people for years, Crypto is a threat to the entire banking ecosystem and many of them are afraid of it because of that and they seek to hamstring any growth in the sector to maintain their monopoly. IMO: Most financial millionaires and billionaires frown on crypto or make negative remarks on it because it is my belief that they see the threat to how they made their millions/billions and long term it could hamper their profits from banking investments. I'm glad to hear you found a bank willing to work with you, one of the fears I have when changing crypto into dollars is what the bank may do with my accounts because of the transactions. However, the bottom line in all of this is that the banking industry and the majority of the people that hold wealth in this world do not understand crypto at all. Thank you for an honest story. I've seen so many people who are just going crazy when they hear about crypto. And the most gruesome thing is that they just don't get it at all.. These are some of my friends (mostly, the bulk of them just went down the drain with crypto) and I don't want them to become so narrow-minded.